I love, love, love Major Crimes. I didn’t think I would, since The Closer and beloved Brenda left. But I gave it a change and fell in love again. I also love Captain Raider, lol. Thanks so much for a great show!!! Great writing and great casting. I hope it continues for seasons to come. such a great show, after the series The Closer cancelled I was so disappointed, now all my fave coppers are back..miss Brenda, but I do like Mary Macdonald’s character! 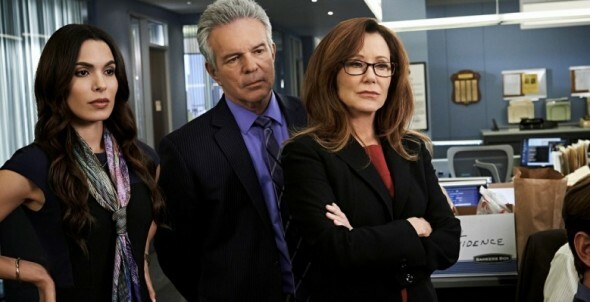 I Love Major Crimes! !!! I CAN’T get enough of the show!!!!!!!!! I love it and the characters. They’ve done a great job of following The Closer without replicating it. I look forward to all the upcoming episodes. I love this series. Each episode is so well written and the cast are loveably quirky. Very happy contract renewed!! Watch the show every week, DVR it when I can’t be home on time just so I don’t miss an episode. Not certain how The Last Ship will expand into a second season but definitely looking forward to finding out!! TNT proves good shows don’t have to come from “normal” stations. In fact most (90%) of what I do watch is on TNT. Very happy that the contract was renewed — I too watch every episode and DVR the ones that I miss. Am looking forward to another season! I love this show! It’s the only show I watch faithfully. Mary McDonnell is an incredible actress. This weeks show was the best yet. And DDA Hobbs is a much more believable character than last season’s DDA. Keep the episodes coming. I love the show, but I wish you’d add a little humor, like The Closer had. Why are you taking Fritz off the show? It was hard enough to lose Brenda and David Gabriel. Fritz carried forward the legacy of The Closer and made it seem authentic. Give us some of that humor back and stop having so many shows with child victims. We don’t want to see that. Otherwise, keep on keeping on! This is great news and love Major Crimes from the beginning. TNT has some of the best shows like Cold Justice, Falling Skies, Major Crimes, Perception, Rizzoli & Isles & The Last Ship. So glad they renewed Falling Skies and The Last Ship too. Keep up the great work TNT because you have become my favorite network. Good, I love the show. What about Rizzoli & Isles and Preception? I love them too. love this show. I have watched it since the beginning. Please keep all the people involved they are essential to the show. it is truly a great series and would watch it for years to come. Thank you for bringing it out and sharing it with all of us.